Tug is a great game to play with your dog, if it’s done properly. So we’re going to share a few rules that should be followed to ensure a successful game. But first, we’ll start by addressing a few of the many misconceptions about tugging that can sour the game in the eyes of dog owners. Q. Doesn’t playing tug with your dog cause aggression? A. FALSE. 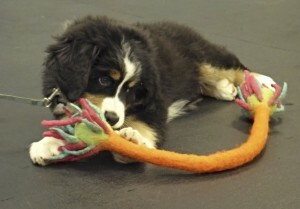 Young puppies play tug-of-war without the escalation of violence. Q. Doesn’t allowing your dog to win tug teach them that they are in charge or as some say “the alpha”. A. FALSE. Tug is a great confidence builder in shy dogs. It can also be used for redirecting unwanted behavior by giving the dog something else to focus on instead of another dog, a bicyclist who just rode by, or even a scary garbage truck going down the alley. As you can see playing tug with your dog can be fun as well as being a behavior tool as long as YOU remain in control. As we mention during class, nothing in life is free, so let’s talk about a few rules for playing this game. Rule #1. The game will ALWAYS start and end with you. Do not play tug with a dog that brings the toy to you. That’s like a teenager demanding you let him have the car the night before he gets his license and you give him the keys. Honestly, that doesn’t sound like you’re in control! It only takes once for a dog to realize something works, so if you give in and play with a dog that demands it, they will do it again in the future, because it worked. Rule #2. Assign a toy to be used for tug and tug only. Every dog prefers something different, maybe it’s a fleece tug, or maybe it’s a Frisbee. If you want your dog to enjoy the game of tug then let him or her pick the toy. Now, this toy is not to be left around the house for the dog to get to whenever they want. A tug is NOT a chew toy and should be used with supervision; if you’re not available then the toy should be put up out of the dogs reach. Warning: socks, shoes, children’s toys, pantyhose and other types of clothing are terrible toys to encourage playing tug. Rule #3. The game starts by you pulling out that extra special toy to tug on, wave it in front of their face getting them excited and interested. Say, “tug” and as soon as their mouth goes on the toy, praise them, and remind them how awesome they are. Once they’re grabbing the toy consistently you can introduce Rule #4. Rule #4. When we ask for a “drop” the dog must obey or the game ends. The easiest way to teach drop is to get a dog interested in the toy and once they are holding onto it, ask for a drop, while waving a treat in front of their nose. When they let go of the toy mark the behavior with a click or “yes” and then deposit the treat into their mouth. Repeat the activity until the dog is dropping the toy by the sound of your “drop” command without a treat being needed. Rule #5. If your dog’s teeth come in contact with your skin, accidental or not, you should let out an immediate “yelp”, end the game, and the toy goes up, no questions asked. This sends a clear signal to the dog that tug is fun, and allowed, but the game will end if they don’t play by the rules. Rule #6. Let your dog win more often than lose. Winning builds confidence and strengthens the bond between the two of you. This can be especially useful with shy dogs! Rule #7. We recommend you stop playing before the dog is bored or has moved on. Ending the game before he/she is ready to stop playing leaves them wanting more and helps to INCREASE play drive. So the next time you pull out the tug to play the dog will be more interested. As you can see you can play a fun game of tug with your dog by following these simple rules! And, here’s another benefit, it’s a great way to wean your dog off treats or food used for training. The opportunity to play tug becomes more fun than the treats or food. This tactic can be used in all kinds of different dog training and dog sports situations (especially agility!). We’d like to hear your input, do you play tug with your dog? What have you found is your dog’s favorite tug toy? our private lesson with liz was so helpful. Mavis did a 20 second “watch Me” with the cat sitting next to me! She really showed me how to apply what we have learned at the zoom room to our situation. Thank you!